History and Traditions: Lincoln County was carved from territory ceded to the United States by the Cherokee and Chickasaw Indian tribes. The Elk River, called "Chewalee" by the Indians, flows through Lincoln County. Legislation established our county during their session on November 14, 1809 to become effective January 1, 1810. Lincoln County was named for Revolutionary War hero General Benjamin Lincoln. He served under General George Washington and was known for being appointed by him to accept Lord Cornwallis' sword as a symbol of England's surrender to the American Colonies, thereby ending the American Revolutionary War for Independance. Benjamin Lincoln was named Secretary of War and later given charge of the Port of Boston. The Tennessee state legislature appropriated funds to purchase 100 acres of land for the county seat from Mr. Ezekiel Norris for $100.00. 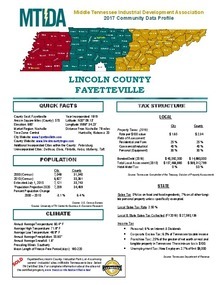 The name "Fayetteville" was chosen in honor of the many settlers who came here from Fayetteville, North Carolina. The first church in Fayetteville was the Presbyterian Church, known at the time as the First Church of Fayetteville. It was established in 1812. Interesting Facts: The first item to be considered by our pioneer forefathers was a lot for the County jail, or calaboose. It was built in 1810 by Ephrahim Parham for the sum of $19.87 ½. The first circuit court was established in 1810 and the first chancery court was established in 1835. During the War of 1812, Lincoln County furnished a company in General Andrew Jackson's army and participated in the Battle of New Orleans. In 1846, Lincoln County also furnished a company of men for the War of Mexico. Known as the Lincoln Guards, the company distinguished itself for gallantry at the battles of Monterey, Vera Crus and Cerro Gordo. During the Civil War, Lincoln County furnished 21 companies of infantrymen for the Confederate Army. A number of famous Americans, including Davy Crockett, Sam Houston, Daniel Boone, and General Andrew Jackson, have lived in or visited Lincoln County. Our gravity-flow water system, located at what is now known as Wells Hill Park, was the first of its kind in the United States. Engineers from as far away as New York came to see it in operation.